For the latter part of two years, in the changing landscape of the WWE, one thing has remained constant. No, not John Cena still being the same character he was ten years ago (although, good guess, guys). I'm talking about the second-longest WWE Tag Team Champions since the Tin Romans were made to be the exclusive tag team title in the company. I'm talking the Booty O's-shilling, Power of Positivity-exuding New Day. During this week's RAW, we saw a kink in the team's armor as team cheerleader/sixth man Xavier Woods doubted their chances against a resurgent Wyatt Family. But, would the WWE be foolish to split the team up when they're at Shield levels of popularity. Ehhh...yes and no. I'll keep this one brief, since I know we've a lot on our plates these days, wrestling and otherwise. Let's start with "yes." The New Day were one of the few bright spots in the 2015 ratings plummets. Maybe that's being a bit dramatic, but without Kofi Kingston, Big E, and Woods, a lot of people--myself included--would've tuned a lot of RAW and Smackdown out. On top of that, the trio is a merch goldmine. They've had runs of having the top merchandise out, over Roman Reigns, Cena, and others. Additionally, the group has shown they can work as heels, tweeners, and faces (even though they're best suited as goofy faces you can't help but cheer and see what silliness they're going to get into next). They're kind of like Edge & Christian, if Edge & Christian also had a trombonist who'd got his PhD. 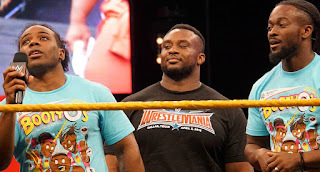 While a bit of the luster has worn off the trio, I can see why it'd be another bad call in a line of bad calls when it comes to tag teams to break up The New Day. However...all good things must come to an end. How many times have we seen a gimmick or a team outlive their usefulness, funniness, badassness, or what have you? WWE has gotten better with killing off tag teams. It's not all just "oh, crap. Someone's turning heel and someone's getting the crap kicked out of them through a windowpane" anymore. Yes, it worked still when Seth Rollins backstabbed Roman Reigns and Dean Ambrose, but that was just greatly thought out and even better in execution. You don't often catch lightning in a bottle twice. And, yeah, I know that WWE is potentially trying to be interesting. But, other than Xavier Woods turning out to be some sort of cross-dressing Sister Abigail (stupid idea, don't do that), I don't really know how breaking them up would be that much better...unless you've got Apollo Crews taking Woods' place and having Woods go all Black Daniel Bryan on our asses. But, outside of that? I don't really see any reason to break them up. I can see why it may be something to do when they're nothing to do. But, ehhh...let's keep the trio together a bit longer. They're still pretty fresh. Just, like they've done with The Wyatts, give them formidable feuds that have them showing depth to their characters outside of P.O.P.